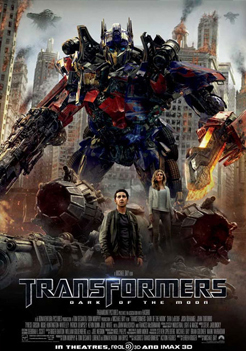 2011, Paramount Pictures AND HASBRO. Directed by Michael Bay. Running time: 157 minutes. PG13. Helm: T'was a big film. Helm: It did not make a tremendous amount of sense to me. Mathew: It's not about making sense. Mathew: KNOCK IT OFF, HELM! First, you almost gave away a critical plot point. And second, that thing you're talking about doesn't matter because A. This is a Michael Bay film and B. It's Transformers. Helm: I do not understand. Mathew: Look. Michael Bay is like some kind of eye-candy-pyromaniacal idiot savant. His films aren't about plot or logic. They're about jets and underpants models and cool army dudes walking in super slo-mo while crap blows up behind them. Then, on top of that, this is a movie based on some kids' toys from 1984 that were robots that turned into trucks. Kids don't care about plot or logic when they're playing with robots that turn into trucks. Especially boy kids. They just want the robots to kick each other's asses and blow stuff up. Helm: Ah. That helps considerably. From that vantage, this movie was quite enjoyable. Now, for the audience's benefit, I want to be really clear about this--this movie was way more coherent and cool than the last one. That last one was almost incomprehensible. This one had multiple stretches--sometimes up to a half hour long--that pretty much made sense. Pretty much. Helm: For example, the beginning was almost like a movie directed by someone other than Michael Bay. I am speaking in terms of coherence only. Mathew: Yes! It was completely clear and comprehensible. Well... kind of. I mean, it was a little weird that the Autobots would take the one weapon that could save their planet and put it on a spaceship and try to fly it off to somewhere else. I mean, that was kind of a mystery right in the first minute of the film. Helm: And that mystery only deepened as more was revealed. Wait... is it still called a mystery if it just doesn't make any sense? Or is there another term for that? Mathew: The term for that is MICHAEL BAY. Helm: I was also puzzled by the Bruce Brazos (John Malkovich) character. What was his purpose in the film? Mathew: Best not to think about it too much. But he was way better than that inexplicable roommate character from Revenge of the Fallen. Helm: And what was going on with the character Dutch (Alan Tudyk)? Mathew: Best not to think about it too much. But he was way more interesting than Simmons (John Turturro) in Revenge of the Fallen. Helm: And where was Optimus Prime when that thing happened with Sentinel Prime? Mathew: Best not to think about it too much. But wasn't it totally cool that it was Leonard Nimoy doing the voice of Sentinel Prime, and he has that line about the needs of the many! That was freaking hilarious. Helm: Agreed. Actually, the humor in this film was much better than the humor in Transformers 2: Revenge of the Fallen. Mathew: Much better! I got the impression that the funny stuff in this film was actually intended to be funny rather than just, you know, totally non-sequitur. Helm: Even the underwear model in this film seemed marginally more intelligent than the one from the previous two. Mathew: I know! Although it was a little distracting when her lips were so big during that middle section of the film. What do you think was going on there? Helm: Best not to think about it too much. But her tiny little skirt was nice. Helm: This movie was actually quite long for going by so fast. Mathew: Yes! But not long like the last one. Long in a good way. That's the magic of Michael Bay. Whatever he's serving up, he serves up a huge pile of it. So, when it's working, awesome. Of course, when it's not...well...Transformers 2.